Perpetually changing artisanal toppings atop airy, crackly crust make this Roman-style pizza shop worth braving the lines. If you asked me to name two things the Chicago dining-scape already has plenty of, I’d reply, “fast-casual restaurants and pizza joints.” So did we need a spot that fuses the two? Theoretically, no. But gastronomically, yes. 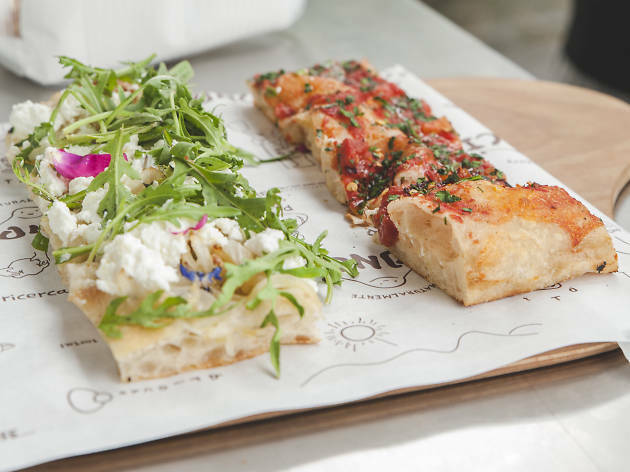 Bonci is the namesake of legendary Italian pizza maker Gabriele Bonci, whose landmark Roman shop Pizzerium slings some of the best scissor-cut (al taglio) slices in Italy. The West Loop storefront marks his debut on U.S. soil, and those springy, crispy pies piled with all manner of artisanal goodies taste like nothing you can get around here. The mister and I dropped in early on a Saturday night, hoping to beat the long lines for which this newcomer is already notorious. A red ticket dispenser sits just inside the entrance of the narrow, high-ceilinged shop. But if you’re like me, you will likely be too overwhelmed to notice it on your first visit. Breathe and persevere. A manager will approach you any second to calmly explain how this works. Just like at a deli, you take a number and browse the long display case filled with 20 some rectangular trays of red and white pizza while you wait. Likely one or two of the 24 available stools will open up by the time you pay. Your pizza choices may include anchovies draped over oozy burrata, fior de latte with crimson ribbons of prosciutto crudo, or cubes of potato blanketed in lightly blistered mozzarella. Maybe there will be bufala, cured salmon and chives; or burrata dotted with Nduja Artisans’ ‘nduja and fresh mint. None last long. Here the only constant is the crust. Too light for pan or foccacia comparisons and too springy for thin crust parities, Bonci’s crust is the studied culmination of imported heirloom wheat flour blending, 48 hours of fermentation to build structure and flavor and a 300-degree bake on cast-iron pans inside Italian Castelli ovens—till it achieves the Goldilocks of rise and caramelization, a cobwebby, lightly tangy interior encased in a shell of crispiness. “Gimme me that last zucchini!” I shouted. Oddly enough, the frenzied pace is part of the fun here, too. You’ve barely mourned the end of a red pie with ricotta, olives and soppressata when out comes one heaped with tender, peppery meatballs under a blanket of Parmesan snow. “The meatball’s my favorite,” our server confided. We later agreed. By the time we’d settled up at the far end of the counter, the line had snaked out the door and halfway down Morgan St.
“Can you imagine if we’d gotten here 10 minutes later? We wouldn’t have gotten the meatball!” I chuckled. 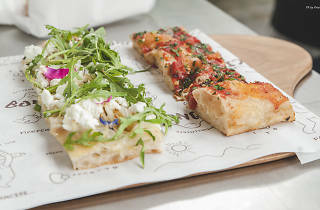 Atmosphere: This hectic counter-service spot traffics in oft-changing, Roman-style pizza by the rectangle, with deli-style ordering. What to eat: Pizzas change multiple times per day here, but if you spot a tray of meatball- or potato and mozz-topped pies, grab a slice. What to drink: A selection of easy-drinking Italian beers, Revolution cans, Underwood and Tiamo canned wines (all available to go), plus imported and domestic artisanal sodas. Where to sit: With just 24 counter seats sprinkled throughout the narrow, crowded space, grab whatever’s open, or take it to go (it travels well). If you can nab one of the stools in back overlooking the kitchen, you’ll get a front-row seat into Bonci’s process. I came here opening day to check this place out. The ordering is strange as it's done by weight and there's such a variety of different pizza choices. The pizza itself is pretty good, definitely something different than what Chicago is currently offering. Staff is very friendly.